Apple consistently markets the fact that its major advantage over competitors in most of the markets it’s involved in, is the fact that it designs and develops its own hardware and software to work harmoniously together. It’s this marriage of hardware and software which allows superior performance to be achieved on its range of devices. However, if you own an iPad, you may want to check out this video showing Mac 7.5.5/6.0.1 running horrendously slow on an iPad Air 2. It’s worth noting that this isn’t something that the average owner of an iPad Air 2 running iOS will be able to replicate in their spare time. In fact, it’s likely that this video will serve as a visual prompt only as to what is possible with those with the technical knowledge, as well as potentially convince a few with the required abilities to give it a bash themselves. From a technical aspect it’s very nice to see Mac OS booting up on the gorgeous Retina HD display of the iPad. From a modern day usability perspective, it’s horrendous to see just how lethargic and slow it is to run. The iPad seen here is running iOS 9.0.2, and is kitted out with an installed version of DOSPAD, working atop the vMac emulator for MS-DOS. This allows Apple’s Mac OS to be emulated onto installed devices. From initially starting the launch of Mac OS 7.5.5 on the iPad Air 2, to it actually being in a position to select the “About This Macintosh” option from the File menu, takes approximately 2 minutes. As you might expect from an emulated desktop software running on an iPad, it’s a painfully slow experience. The video then quickly moves on to show the same process for Mac OS 6.0.1. This includes executing the vMac command from the DOSPAD command line and then waiting for the extremely old-school version of Apple’s Mac OS to boot up. It’s a quicker process this time around with the “About This Macintosh” screen displaying a Finder version of 6.1 and a System version of 6.0.1. There are no additional details given in the video, but it’s definitely worth seeing how far we’ve come with OS X. 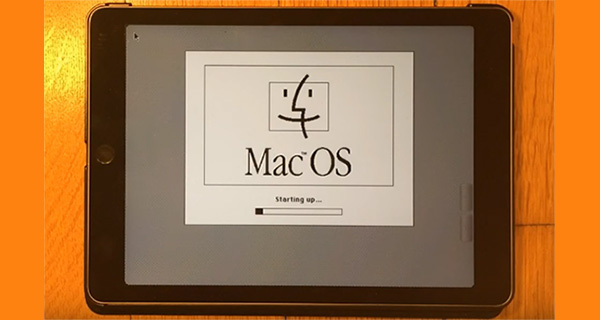 If booting up a legacy version of Mac OS comes as a surprise, it’s worth knowing that iPad Air 2 was previously shown booting up the old Windows 98 operating system as well, using the same DOSPAD emulation software. Neat! 😀 Would it work on iPhone 6 plus ? Wonder. Wow. As they say in Japan, natsukashii. This would be nice cause all mine does is collect dust and I just place my phone on it as a coaster. iPad Pro 128 Gb could easily dual boot maybe OSX 10.5???? Does it include the ROM ? Actually, they’d more likely say tsumaranai and kudaran.